Building on a successful partnership between World Land Trust (WLT) and Nature Kenya, WLT is now supporting a ranger at Kinangop – Andrew Mwangi Waweru – through the Keepers of the Wild programme. 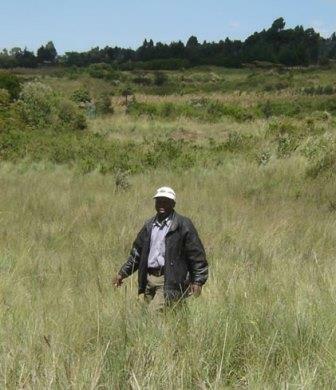 Andrew has been involved with the Friends of Kinangop Plateau (FOKP) community group for over 17 years, and now works as a ranger at Leleshwa Nature Reserve within the Kinangop Grasslands Plateau. Andrew, 45, has come to recognise the importance of the role he plays as a ranger for Leleshwa Nature Reserve, and the difference it has made both to himself and his family. Leleshwa Nature Reserve is just one of four reserves purchased and protected by Nature Kenya and FOKP and Andrew works in all four of them. His main day-to-day responsibility focuses on site protection: monitoring illegal activity and dealing with immediate threats to the grasslands habitats, which ranges from unauthorised grazing or harvesting of grass to outright vandalism at the reserve. Living on site means that Andrew is on-call 24 hours a day, and after working his normal eight-hour day, Andrew also has to provide the necessary security against illegal activity at night. And although FOKP volunteers help with the daily monitoring tasks, Andrew mentions that ‘extra hands’ would be beneficial for increasing security in Kinangop, especially now there are four reserves to be protected. Andrew’s daytime activities include: managing the Eco Resource Centre and hosting visitors and school groups to the reserve; monitoring activity on the reserve, as well as ongoing land use on farms surrounding the reserves which may have an impact on the wider ecosystem. Resources available to Andrew can be limited, and simple equipment such as binoculars, field guides, two-way radios, or a good quality compass – items that would be thought essential for carrying out a ranger’s daily responsibilities – are often hard to come by, not to mention specialist biodiversity monitoring equipment or even computers. Outreach and environmental education is another important activity for Andrew’s role as a ranger, and his involvement with community groups is one of the aspects of his job that Andrew enjoys the most. He regularly visits local schools to carry out environmental education programmes, and also organises conservation awareness field days at the Eco Resource Centre, giving out tree seedlings for local people to plant at home. The work of a ranger is never easy and Andrew spends time addressing the concerns of farmers whose land borders the reserve areas. Human-wildlife conflict is a particular issue, crop damage from wild birds, for example, or loss of livestock to large predators such as Hyenas. Dealing with these concerns is of great importance to the work of FOKP, which functions as a site-support group, initiated by local people themselves. There is also widespread disquiet over loss of community grazing grounds due to private purchase and Andrew recognises that despite the ongoing effort made by Nature Kenya and FOKP, support from the local government is key to the long-term protection of the grasslands. 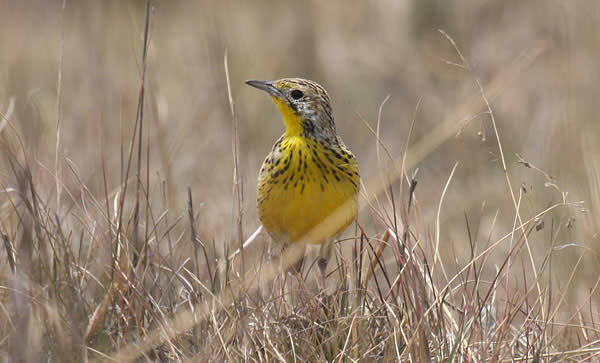 Kinangop is home to rare species such as Sharpe’s Longclaw. © Charles Moores. 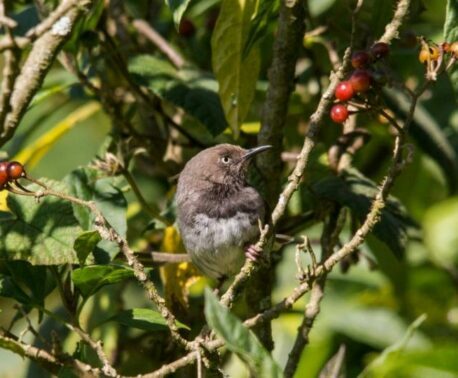 Located in Kenya’s Central Province, the Kinangop Plateau comprises of 190,200 acres (77,000 hectares) of largely unprotected grassland, which is vanishing at an alarming rate along with the wildlife it shelters. 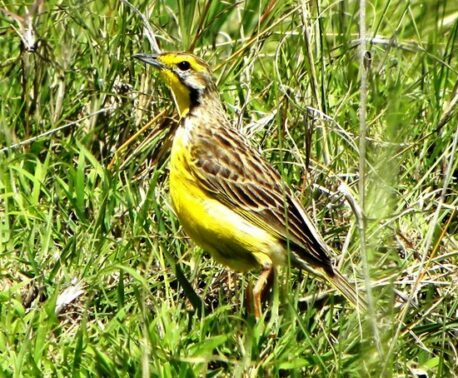 Originally, the Kinangop plateau was almost treeless, covered with tussock grassland and bogs, but today the grasslands are seriously threatened by conversion to agriculture and replacement of the native tussock grassland for species that are more palatable for livestock. WLT is raising funds through the Keepers of the Wild appeal to support rangers to protect reserves that WLT has helped create. You can help Andrew and other rangers like him by making a donation to Keepers of the Wild.